At first I was like "Oh my God, this is amazing! Why hadn't I heard of this before?" And then I read the "Play only if it is Night." It's a really good effect, and somewhat worth the hoops you have to jump through, especially since Shub has a few other strong Night cards. But it's definitely not an auto-include. OK, it needs night. 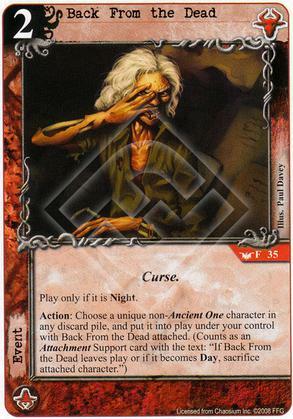 This is a Shub card we are talking about so no problems there, just prevents it going into every single deck with red cards. So much potential use from the effect, especially if you are recurring a character that has a "sacrifice this character to" ability, or are cultist heavy anyway, or just get Peaslee back! If including this generally you can't rely on the opponent having the right discard pile, so you have to build it yourself. Good card overall. Of course, there is some competition in the form of Dark Rebirth, which is 1 more cost and loyal but gets back a lot more characters. I'd say choice out of those cards depends on whether you are put off by the loyal cost. Not quite as good as dark rebirth in a mono deck but fits very nicely into any night deck. To get the best use out of this you need to construct your discard pile, while this is a shub specialty it does mean this card requires extra effort to use well. Relying on your opponents discard pile just isn't good enough, even if you are running mill.